Ronda is an ancient town located within the province of Malaga. If you come to visit the Costa del Sol, don´t leave without visiting Ronda. Ronda is among other things famous for having the oldest bullring in Spain, dated 1785, and the New Bridge, built between 1759 and 1793, with an interior cabin that was used in its beginnings as a prison. Ronda is the place chosen by many tourists seeking the typical beauty of the Andalusian villages, culture, monuments ... Ronda is a town of Malaga difficult to forget and internationally known which should not to be missed. The price of the excursion to Ronda is 36 € and its duration is 1 day, with weekly departures from Malaga every Tuesday and Saturday throughout the year. What is included in the excursion to Ronda? A luxury bus will pick you up at your hotel or nearest to your residence for a guided visit to Ronda. You will visit the Church of Santa Maria la Mayor, the former Arab mosque in Ronda; the New Bridge with its breathtaking views, from where we recommend to take pictures, and the oldest bullring in Spain among many other attractions. After lunch will be departure to Puerto Banus, with a stop of 45 minutes and then travelling back to your point of origin. If you plan to go during the winter do not forget to bring warm clothing as it is very cold in Ronda. During the summer, wear light clothing and a sun hat. The use of comfortable footwear and clothing is always recommended. Do not forget your camera, you're going to take some truly memorable pictures in Ronda. Where can I book an excursion or tour to Ronda? 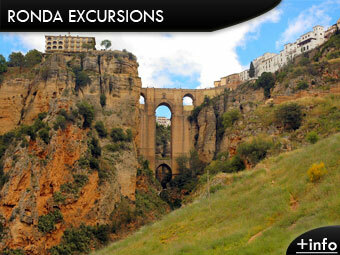 We recommend to book your trip to Ronda in advance to avoid availability problems. Malaga to Ronda: Here you will find information on how to get to Ronda from Malaga and the different options. Transfer from Malaga airport to Ronda: For you, your family or a group of people. Check prices and different options from Malaga airport.